The Peace Sanctuary is a place of peace. Whether alone or surrounded by the company of friends, one feels the embrace of God’s presence. It is a safe home in which one can rest, pray and be. The abstract painting, simplicity of the elements and the light dancing through the space renew our strength and energy. 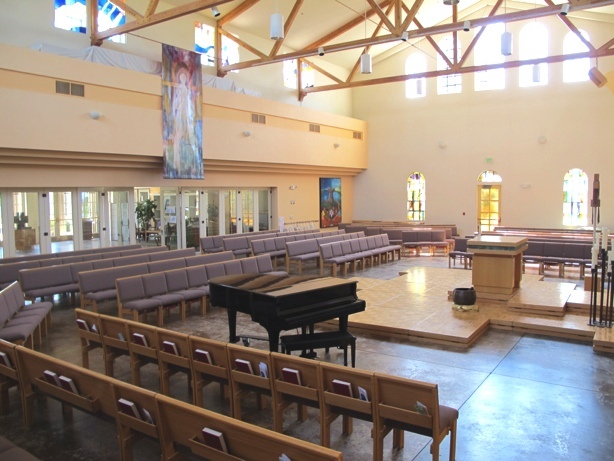 The flexibility of seats, platforms and altar encourage a variety of settings for worship and contributes to the Interfaith Community’s appreciation of Peace as a House of Prayer for All People. Come, enjoy the energy and the embrace.